Now is the time most business owners are assessing the past year’s successes, challenges and failures and planning strategies for the new year. Especially for busy small business owners, planning strategies for growth and development in the year ahead can be daunting. As you map out your goals for 2012, here are five things you can do right now to create positive change for your business. 1. Evaluate your client list. Take a hard look at your current list of clients. Are some clients weighing you down with too many hours or unreasonable expectations? If so, it’s time to adjust your contract and pricing or simply let them go. Get rid of unprofitable clients, and you’ll be surprised by how quickly the door opens to new and better opportunities. 2. Schedule time for the business of your business. This is a tough one for any small business owner, but it’s absolutely essential. We all get bogged down by looming project deadlines, which can make it hard to carve out time to work on marketing, budgeting or improving your team’s efficiency. Schedule this time into your workweek. If you don’t, your business will stagnate and you’ll spin your wheels just keeping up with the work you already have. 3. Shift your approach to branding. As a small business owner, you are the face of your business. Everything – and I mean everything – you put out into the world is part of your branding. Think carefully about how you present yourself not just through your company’s website or marketing materials, but through social media, at meetings and events and even at a social gathering (you never know where you’ll meet your next client). Are you projecting a positive, successful and knowledgeable presence? Use these forms of communication to build your reputation, demonstrate your value and make people think – we really need to work with her. 4. Learn from others. I was fortunate enough to participate this year in a formal group mentoring program for women in business. The opportunity to learn from this group of professionals, most with very different experiences than my own, was invaluable. No matter how many years you’ve been in business, you can always learn from others. Whether it’s through a formal mentoring relationship, industry event, webinar or simply lunch with a fellow small business owner, treat every interaction as an opportunity to learn. 5. Think positively and confidently. One of the biggest game changers for the way I run my business was to stop thinking like a small business. Sure, we’re a small team here at Canary Promotion, but that doesn’t mean our services are any less valuable or that we can’t go after big projects. Define what sets your business apart, what problems your personalized service can solve that no one else can in quite the same way, and don’t shy away from going after that big project because you think you’re “the little guy.” Be realistic but ambitious. Running a small business is part careful planning and part leaping first and looking later. Knowing when to leap might be the big difference in your success this year. 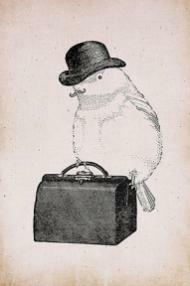 Adorable business bird image courtesy of my new favorite blog, justbirds.tumblr.com.